Stem Cells are cells with the ability to renew them through mitosis and to give rise to specialized cells. They have the potential to develop into many different cell types in the body during early life and growth. In many tissues, they serve as a sort of internal repair system, dividing essentially without limit to replenish other cells in live humans or animals. 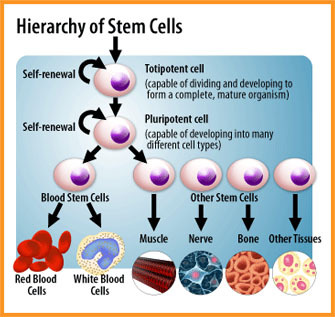 When a stem cell divides, each new cell has the potential either to remain a stem cell or become another cell type with a more specialized function, such as a muscle cell, a red blood cell, or a brain cell. There are many ways in which human stem cells can be used in research and the clinic. Perhaps the most important potential application of human stem cells is the generation of cells and tissues that could be used for cell-based therapies. Stem cells offer the possibility of a renewable source of replacement cells and tissues to treat diseases including Alzheimer's diseases, spinal cord injury, stroke, burns, heart disease, diabetes, osteoarthritis, and rheumatoid arthritis.